Private Beach at Maushop Village. Open Floorplan. View from Living Room. Living Room with newly sanded floor, and new furniture. Dining Room. Sit 6 comfortably. 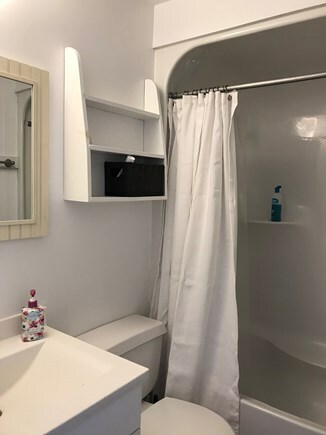 Half-bath on the first floor. Full Bathroom on the second floor. 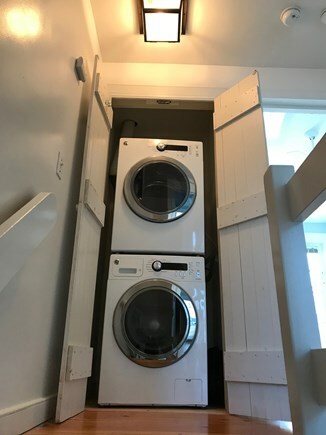 Washer and Dryer near Full Bathroom. Second bedroom with 2 Twin beds. Frenchdoor to balcony. Master bedroom with Queen bed. Frenchdoor to balcony. 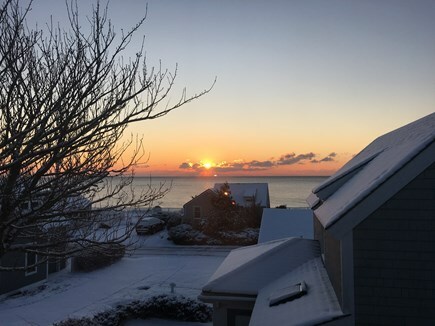 Sunrise View from Master Bedroom. 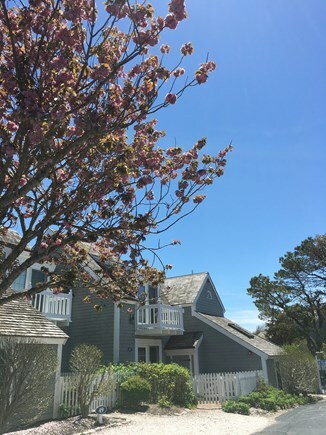 Bright two bedrooms, one and a half bath, two-story townhouse with an ocean view in charming Maushop Village, New Seabury. 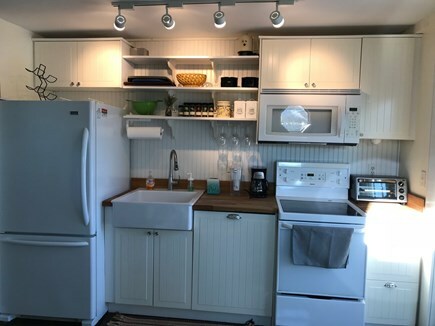 Light filled kitchen including appliances: refrigerator, glass cooktop, microwave and dishwasher. Newly sanded wood floor in living and dining rooms. New living room and dining room furniture. 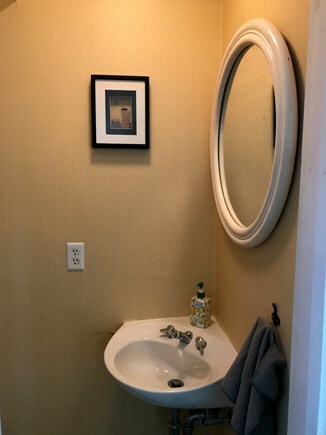 A half-bath is on the first floor. Newly painted walls and ceilings. 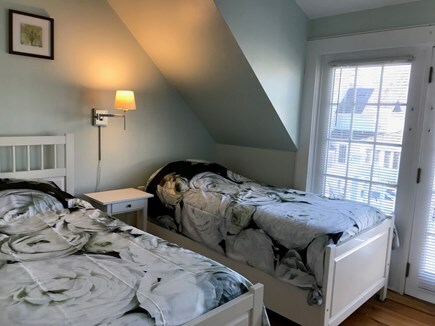 The second floor has two bedrooms (1 queen and 2 twins), each with French doors to its own balcony, a full bathroom, as well as a washer and dryer. Linens are provided. 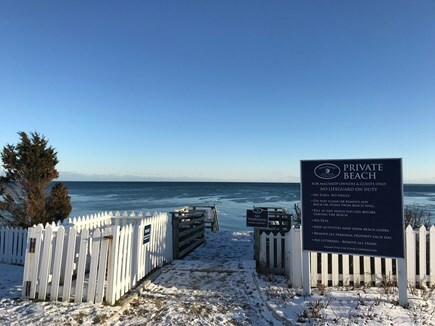 A one minute walk to the private beach on Nantucket Sound. 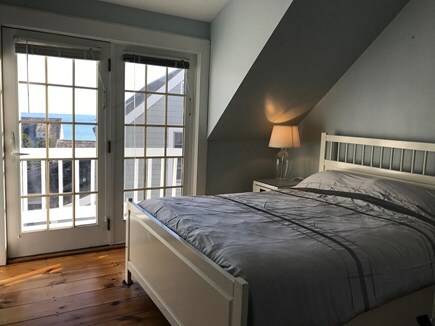 You can hear the ocean waves and watch beautiful sunrises from the master bedroom. 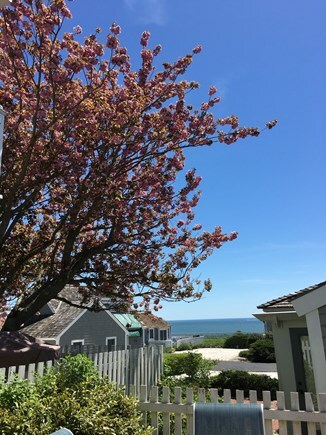 There is an ocean view from the living room, dining room, back patio and from the master bedroom on the second floor. 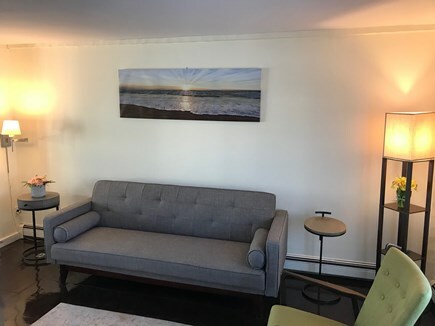 The unit is a short walk to the private Maushop Village beach, and a stroll to the lively Popponesset Marketplace with its Raw Bar, mini-golf, a general store, restaurants, and entertainment for adults and children. 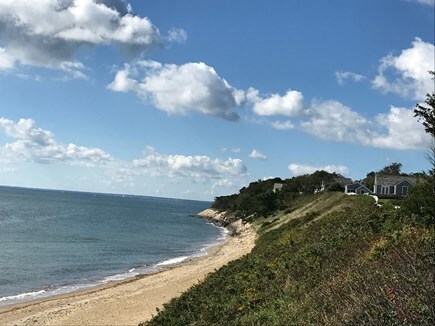 The biking and jogging trail in New Seabury will accommodate leisurely or serious walkers or runners alike. Additional pricing info: There is a $150 cleaning fee. Discount available for multiple weeks. State and local taxes of 12.45% will apply. 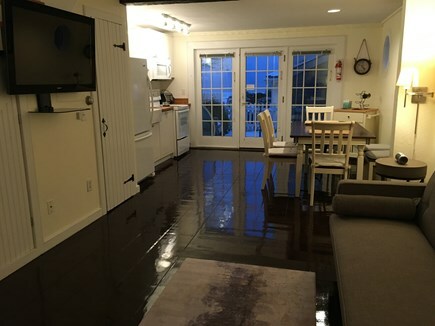 This rental is perfect if you want to be close to the ocean. 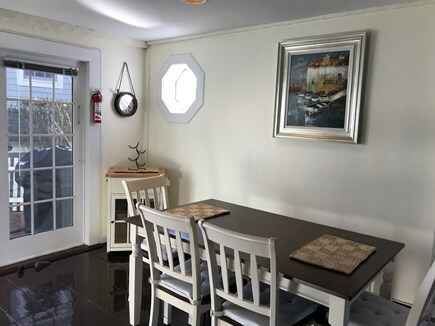 There are ocean views from the living room, kitchen, patio, and upstairs bedroom. The stairs to the beach are about 200 steps (yes I counted one day) from the front door. It is also a short walk to the Marketplace. The Mashpee Commons is a short drive. You can spend the day at the beach and the evening shopping or dining at one of a number of great restaurants. This is a terrific location for everyone. Our family has rented this quaint, immaculate 2 bedroom for the past several years. We love it! It is the one time of the year we find ourselves most relaxed. It's an easy walk to the Popponesset Marketplace - and a great way to start the morning. But we love the fact that within five minutes of walking out the front door, we are settled on a beautiful stretch of sandy beach. We can't wait to get back there this July!!! !